…sugarplums? Or two poufy silk jewelry pouches for two sweet R’s who have just turned twelve (and have had their ears pierced). I’ve just had the best online yarn-buying experience. 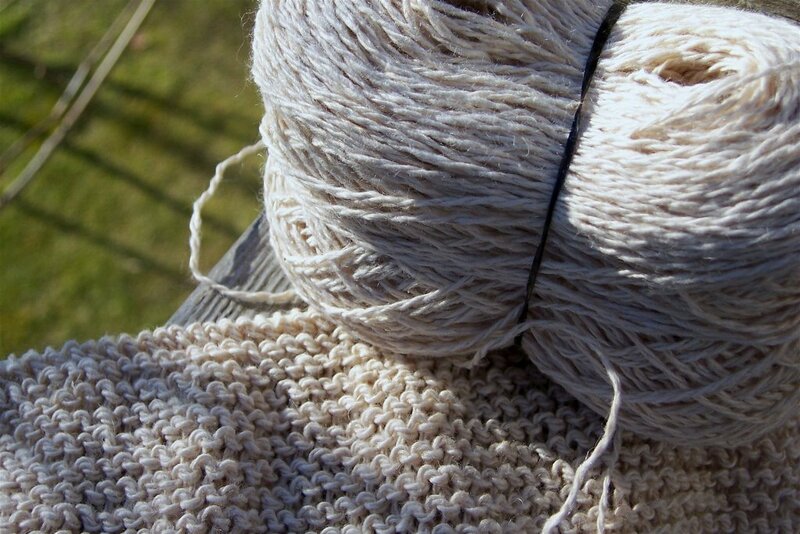 I decided to order some hemp yarn after all, so I headed over to kpixie for a few balls of Hempton and some AllHemp6. I ordered a pattern for a bag, while I was at it. This was on Wednesday morning, and he box arrived on Friday morning! I’ve read about the great service that Jessica and Missa provide, but this was more than great. I’m going to become an instant-gratification girl if this keeps up. 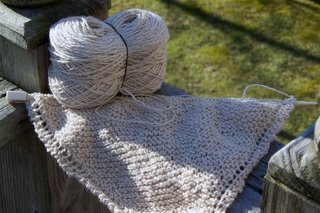 I started this yesterday: Hempton is nice yarn: 50% hemp, 50% cotton. We’ll see how it does for a washcloth. I’m knitting this one on size 3 needles because the yarn just seems to want it that way. I began making a bag, too, but there’s not enough to show off yet. The AllHemp6 is a bit hard on my old hands, so I can’t work with it for extended periods, but it’s knitting up nicely. My hands are worn out from work anyway, and I have to remind myself that they can use a rest now and then. My whole self could use a rest, but with two weeks till Christmas, there’s not much chance of that. I’m pacing myself, and trying to put as many quiet moments into each day as I can manage. Today will be a puttery day. I seem to be in the middle of about five sorting and tossing projects, all in different corners of my apartment. It has to be done sometime, and if I want to make it Christmasy around here I have to clear some space. So on with the Christmas CD’s — Emmylou Harris’ Light of the Stable, George Winston’s December, Shawn Colvin’s Holiday Songs and Lullabys, and A Charlie Brown Christmas, of course! And there’s a party over at J’s tonight, because two R’s have to celebrate, you know.